Amazing skating and stick handling ability; Can hit the net from anywhere; Gets back on defense and is good at creating transition opportunities; Good physical play for a guy known for scoring; Great on special teams; can dominate on the PP and the PK. Turnovers; Takes too many penalties; Sometimes tries to do too much by himself. Statistically, the 2009-2010 season was the worst of Geno’s career. His numbers were lower in every major category (G, A, Pts., +/-, PPG, PPA, SOG) except, unfortunately, PIMs. Of course, he only played 67 games this season due to a should injury which contributed to his lower production. But the biggest problem was the lack of a consistent scorer on Geno's wing. Alexei Ponikarovski was a bust, Fedotenko was inconsistent at best, and Pascal Dupuis came on too later to make a true impact. Despite all of this, Geno was still second on the team in goals, assists, and points. But it is obvious that Malkin is still adapting to the NHL style of play. He still tries to pass when he should shoot, which is not always a bad thing, but not always effective in the NHL. Overall #71 still had a good season. 90% of players in the league would kill for his numbers, even though they were low by his standards. None, but the shelf is still full and expansion has not yet been completed. Once again the Penguins will spend their summer searching for wingers to play along their top centers and Malkin needs the most help. Many have even speculated whether Eric Tangradi can make the jump. 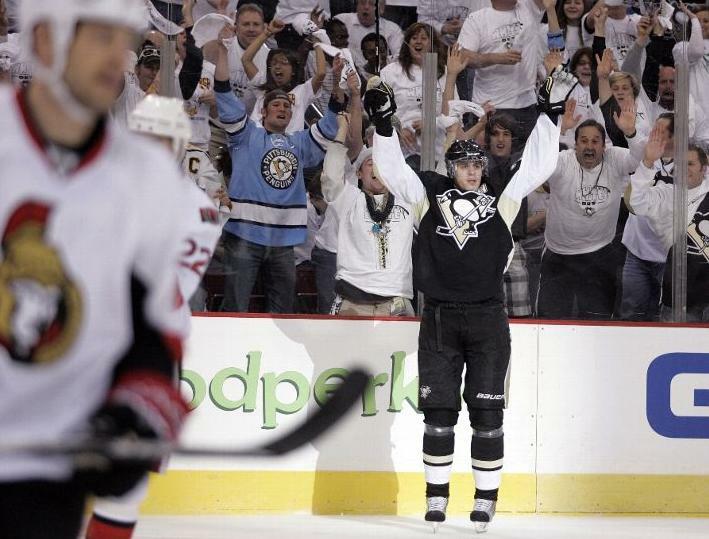 But no matter who ends up on his wings, Malkin will again be one of the best players in the league. Much like Crosby, Geno makes his linemates better which is perhaps his greatest attribute. Look for him to continue adjusting his game and to increase his shooting like Sid did last season. If Geno can also work on improving at the faceoff, he will be even more of a threat to everyone. Get your head out of the rumor mill, Geno will be a Penguin for many years to come.